I was recently sent several bottles of different vitamin sprays from the company SprayActive.com I was sent the Vitamin D sublingual spray and the Vitamin C with Echinacea. These sprays are great because you can throw one in your purse and spray it anytime. Each spray of the Vitamin D has 1000 IU so you just need a few sprays a day. Perfect for kids, they just need 1 spray and for adults the recommended amount is 2 sprays. (I used 4 sprays) They Vitamin C doses are the same. It really doesn’t get any easier than this. I gave one bottle of the vitamin D spray to my dad who has been in the hospital for 3 months and has not got out to get any natural sunlight. He can’t take big pills so this is perfect. These sprays are perfect for kids and anyone who can’t take pills or sometimes forgets to take them in the morning. You can just keep them in your car or purse or at work. They also offer different formulas.They have one called SLEEP to help with insomnia. It has melatonin in it and other natural ingredients. There is also one called CONTROL for sugar cravings and one called ENERGY. Check out their website and you can get more information. I think these products are ideal and perfect for anyone. 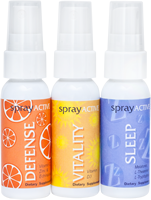 Spray Active™- get the vitamins and nutrients you need in two sprays a day and say goodbye to swallowing pills — forever!